Cooking with oil to add flavor can cause the calorie count of your dish to skyrocket. I prefer to use cooking wine. 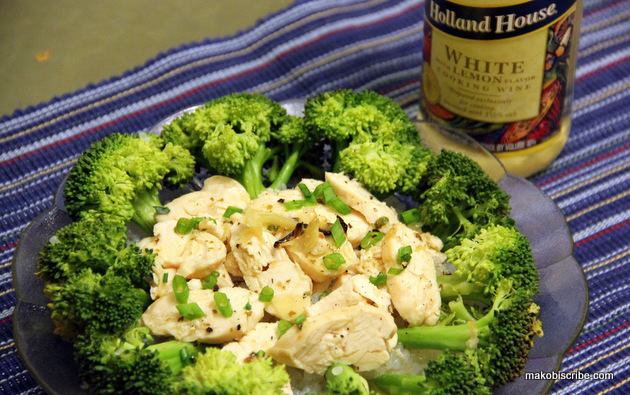 The alcohol content cooks off, and you are left with a low calorie flavored dish. Instead of frying or sauteing in oil, try Holland House cooking wine which now comes in infused flavors. You can also brine your meat in wine for a moist, tender juicy dish. Dry chicken is a dish of the past. Pour ¼ cup of the wine in a small glass cup. Add the chopped green onions, shaved garlic cloves, salt and pepper. When cooled inject the "brine" into the chicken breasts. Broil 6 minutes on each side. Add Broccoli and steam for 6 minutes or until tender. Brining is pretty easy, and you can do it the long way over days or the quick infusion method like in the recipe above. I use a pharmaceutical syringe to inject the meat. The Holland House Cooking Wine brining technique, called “flavor infusion,” is an ideal mix between hot-start and cold-start brine methods. Why should you brine with cooking wine? There’s nothing worse than dry chicken. lol I’ll have to give this recipe a try, it sounds really good! I’ve never thought to infuse anything like that, what a great idea!